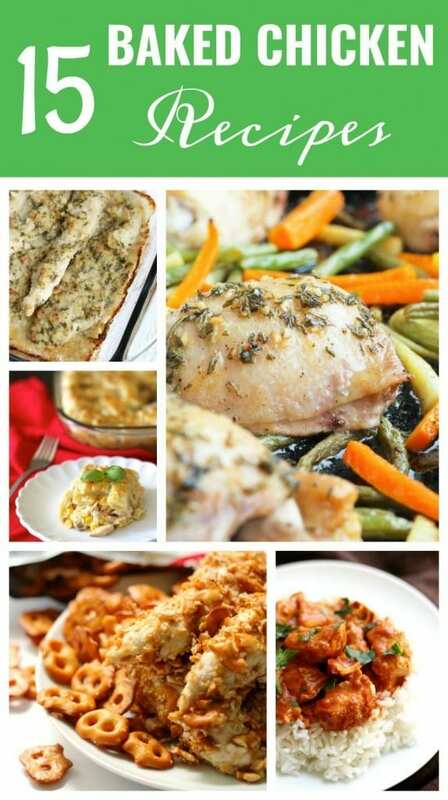 These 15 baked chicken recipes will help on those days you just have no idea what to cook for dinner. Most likely you have ingredients for one of these recipes! Unless you’re living the vegetarian life (and if that’s the case, check out these awesome vegetarian dinner ideas), then most likely you have chicken breasts, a whole chicken or chicken thighs in your freezer or fridge. Chicken is a kid and crowd pleaser and it’s one of those meats you can do so much with. Cook it up on Sunday and you’ll have several lunches and/or dinners throughout the week. 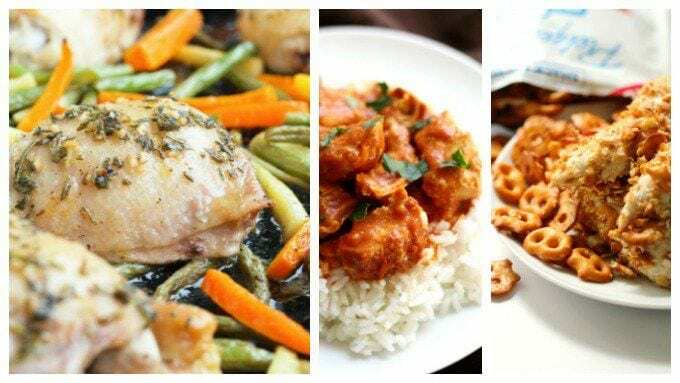 From pesto to Tikki Masala to honey mustard, we’ve rounded up some amazing baked chicken recipes. Have fun recipe browsing. Do you think baked chicken by itself is delicious? Wait until you try this garlic version. It’s to die for. These nuggets are sure to be a favorite with the kids. Bonus: they’re gluten-free. Cook this delicious twist on the regular chicken breast in only 45 minutes. Cheese + chicken? Surprisingly delicious. Who doesn’t love this old-fashioned favorite? This one is super simple and delicious. These chicken legs are covered in a creamy dijon-and-sour-cream sauce that’s unique but delicious. Flavor upon flavor. Have you ever had homemade rotisserie chicken? Well, you should get on that ASAP. According to this recipe, it’s the best way to have it. This recipe combines two wonderful things: pesto and chicken. What could possibly go wrong? With a mixture of sweet AND spicy, this chicken is explosive with flavor and has a flavor for everyone. Try making this Chicken Tikki Masala dish, an Indian dish that’s Paleo, gluten and dairy free, for a taste of the Paleo lifestyle. This unique dish is super easy and could easily be cooked for the kids on a school night. Want to spice up your chicken dish a little bit? Add some salsa for a different and yummy twist on chicken. Baked Chicken Pesto is a great easy dinner recipe that is flavor packed and versatile. This simple pesto chicken casserole is very quick to prep, so you can focus on making sides or just relax. Quick easy chicken parmesan is one of those 30-minute recipes that go well with all the members of the family. A lot healthier than the fried version, but as crispy and tasty. It really ticks all boxes when it comes to a quick midweek meal. This One Pan Chicken and Vegetables with Fresh Herbs recipe is perfect for busy weeknights! It all cooks on one pan, making clean up a breeze.